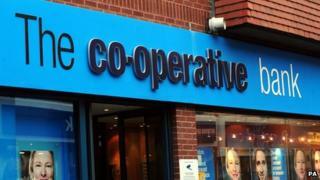 What does Moody's downgrade of Co-op bank mean? A couple of seemingly bad things have happened at the Co-operative bank in the past 12 hours. Its credit rating has been downgraded by Moody's to "not prime" (a euphemism for junk) and it's losing its chief executive, Barry Tootell. How serious are these events? Well I am told that Mr Tootell had been planning to leave for some time - in part because the big part of his job, preparing for the massive expansion of the bank through the takeover of 631 branches from Lloyds, is no longer happening. He has been replaced on an "acting" basis by Rod Bulmer, already in the bank and who is apparently a good thing. In a way, what is most interesting is that, as I understand it, Mr Tootell's departure announcement was brought forward a bit, because the Co-op felt it needed to be doing something, in the wake of the rather dour assessment of its bank's prospects by Moody's. So what is the significance of Moody's downgrade? Well, to state the bleedin' obvious, in the aftermath of the ratings agencies' catastrophically poor performance in the run-up to the great crash of 2007-8, their pronouncements don't have the quite the authority they once did. That said, the downgrade is likely to make it a bit more expensive for the Co-op Bank to borrow, which doesn't help when its profitability is so squeezed (as it is). The bank needs hundreds of millions of pounds of additional capital, to absorb potential future losses. Regulators may force the bank to raise more than the £600m to £800m of capital it is set to obtain from its parent, the wider Co-op group, through the disposal of life insurance and general insurance operations. The bank faces substantial further losses on poor quality loans it has made, especially property loans made by the Britannia Building Society, with which it merged in 2009. In a low interest rate environment, prospects for substantial profits growth at Co-op bank are limited. Now one of the most striking things about Co-op Bank's customers is they seem to love their bank rather more than would be true of customers of the bigger banking groups. That is certainly the evidence of letters and emails I was sent by many of them after the takeover was abandoned of all those branches and assets from Lloyds. So should those customers be anxious about Moody's downgrade? Is the Co-operative group the best owner of a bank, at a time when profit margins in banking are so low, and may remain so? Well there is no reason to believe that their savings are seriously at risk of incurring losses. As Co-op says today, it has plenty of cash or liquidity to hand - I understand it has a cash liquidity buffer of £3bn. Also, the parent group is huge, with assets of £82bn and cash not far off £7bn. If the worse came to the worst, there is plenty of other stuff that could be sold, to provide additional capital to the bank. What I think the downgrade highlights is a point I made after the collapse of the Lloyds deal - which is whether the Co-operative group, with its leading position in supermarkets and funeral homes (for example), is the best owner of a bank, at a time when profit margins in banking are so low, and may remain so. How would those who work in all those other Co-op businesses feel about any profits they generate being poured into the bank, thus limiting the ability of their operations to expand? Moody's downgrade will further sharpen a debate within the Co-op, under its new chief executive Euan Sutherland, about whether it should get out of banking. There is a bit of nonsense in my blog, for which I apologise. When I was away from my computer screen, I asked the Co-op to email me a number for the value of group assets, so that I could give you some sense of what it could flog - in a worst case - if it needed cash in a hurry. What it sent me was the assets including banking and insurance assets - i.e. including the loans and investments it has made. For some reason, it didn't occur to me that the £82bn included all those tens of billions of pounds of financial assets (my pathetic excuse is I have a cold). Anyway, that enormous number is only semi relevant. More relevant for assessing the ability of the non-financial part of the group to support the bank is the Co-op's gross assets in non-financial operations of £6.3bn and the larger Co-op's net equity of £4.5bn. So there is value in the rest of the Co-op, but it is not unlimited. Which rather reinforces the notion that the long-term health of the broader Co-op may require it to find a buyer for the bank.